May is Celiac Awareness Month and Catelli is giving away gluten free pasta for a year! wait what? Ya! gluten free pasta for a year! So what should I do first? Give you contest details or a great recipe we came up with using their pasta? Okay okay, I'll give you contest details and hope you stick around for the recipe. Between May 4 and May 31, 2015 visit the Catelli Facebook Page to post your favourite pasta recipe in their Gluten Free Pastabilities Challenge. The three people whose recipes get selected and have the highest number of likes on Catelli’s Facebook page will receive a year’s supply of gluten free pasta, courtesy of Catelli. Catelli will post their official rules and regulations when the contest starts. One more extra bonus, here is coupon to buy some Catelli Gluten Free Pasta. You're welcome. 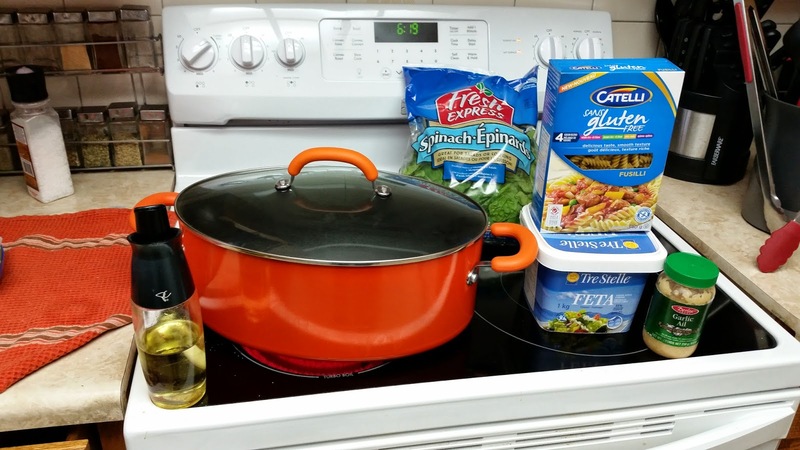 Read about Catelli's gluten free pasta at the end of this post. Did you know their pasta is made in a dedicated gluten free facility and is certified by the Canadian Celiac Association Gluten Free Certification Program? Now for my contribution. We want to share with you a simple pasta recipe that works great with Catelli's gluten free fusilli. 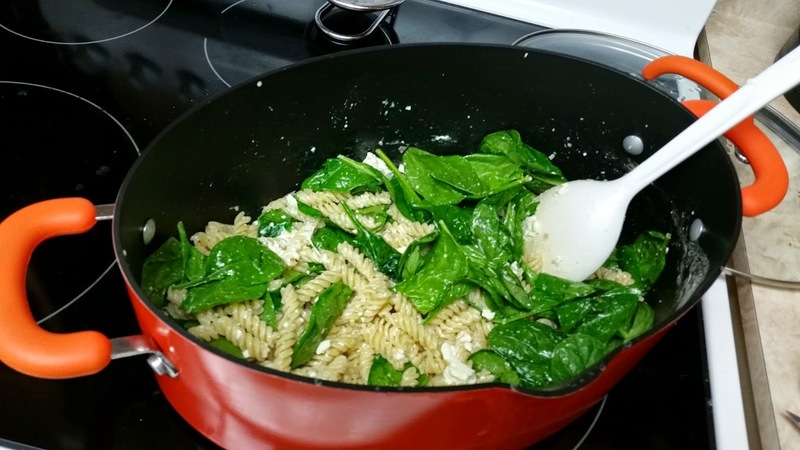 We don't really have a name for it except for Fusilli Pasta with Feta and Spinach. Make pasta according to directions in a large pot. Be sure to salt the water well it really adds good flavour. Don't add oil to the pasta, because although you may believe it helps the pasta to not stick, it also stops any sauce and flavours from sticking as well. Drain pasta and add back to pot. Turn burner to medium or less. Add feta and spinach and toss around until spinach turns a nice deep green. You don't necessarily want to cook down the spinach. Just make it nice and soft. It will add volume to your pasta. Serve in shallow bowls and eat with your favourite gluten free baguette. Lucky for us in Edmonton, Kinnikinnick Foods has fresh gluten free baguettes available weekly.